All Mad City Labs piezo nanopositioning stages are designed and manufactured with the goal of eliminating unwanted coupled motion. By eliminating coupled motion, pure linear motion is achieved. Pure linear motion piezo nanopositioning stages give accurate results: the shape and size of objects measured in microscopy imaging applications are correct, the stage behaves identically when moved in the forward and reverse directions, and the position of one axis is independent of the positions of the other axes. 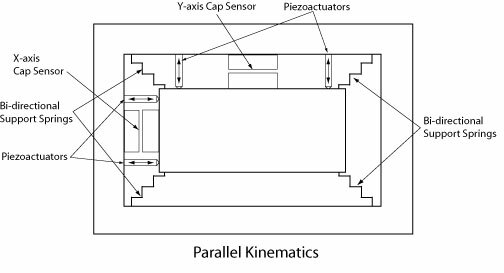 To understand coupled motion and the effects they have on piezo nanopositioning, it is necessary to concentrate on the angular coupled motions of roll, pitch, and yaw. 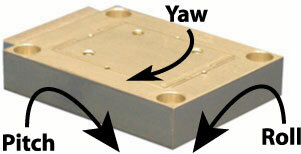 In the picture below, the angles of roll, pitch and yaw are shown for a single axis piezo nanopositioning stage. The positioning errors due to coupled motion are easily calculated. For the following example the X-axis is defined as the translation direction and positioning errors due to yaw occur in the XY plane. Positioning errors due to yaw are dependent on how far the point of interest is located from the stage center (D) and on its angular position (q). See the figure below. The positioning errors are ex=D(Yaw)sinq and ey=D(Yaw)cosq. Similar relationships can be derived for roll and pitch. Every Mad City Labs piezo nanopositioning stage has been analyzed and refined to minimize coupled motion. Typical roll and pitch values are less than 1 microradian. Typical yaw values are less than 3 microradians. To achieve long range nanopositioner motion in a moderate footprint the piezoactuator motion is often mechanically amplified. Amplifying the motion of a piezoactuator can result in parasitic coupled motion. Among these parasitic motions are the introduction of rotations about the X, Y or Z-axis, as described above, as well as direct coupling of a translation in one axis to another axis. Quite often these parasitic motions are non-reproducible, making them impossible to correct. For example, a number of piezo nanopositioners on the market use parallelograms to amplify motion. Such a device is shown schematically below, where coupled motions are clearly unavoidable. Another type of controlled motion is often called "parallel kinematics". This method attempts to use the electronic position control of each axis to correct for coupled motions permitted by the mechanical design. See the schematic figure below. Position sensors monitor the motion in each axis which, ideally, allow the controller to "see" unwanted coupled motion and correct it by moving the appropriate piezoactuators. In other words, coupled motion is not prevented, it is measured and corrected. The problem with this approach is that the two capacitive sensors combined with the controller "assume" that every unwanted motion is directly in-line with one of the axes. Rotational coupled motions (roll, pitch, yaw) are "seen" as linear displacements - resulting in improper corrective motions. Additional position sensors and complex control algorithms could produce better corrective motions but this complexity is often eliminated to reduce system cost. Mad City Labspiezo nanopositioners use only true flexure guided motion combined with "pure motion amplifiers". Each axis of the piezo nanopositioner is mechanically controlled by a flexure designed for that axis. Axes of motion never share a flexure (like in the parallel kinematics design) because coupled motions are then unavoidable. Properly designed, true flexure guided motion prevents coupled motion between axes. Specially designed "pure motion amplifiers" are used to achieve mechanical amplification where long range of motion and a limited footprint dictate that amplification is necessary. Pure motion amplifiers are designed by a strict set of rules, which virtually eliminate coupled motions.